Not everybody in Erath County knows about the Humane Society Animal Shelter and its adoptable pets. A few of the people that do know about it have the wrong impression. They often think of it as dog pound-hell. Maybe after reading the following story of the combined efforts of many people to make happy endings happen, they will change their minds and convince more pet lovers to adopt a pet instead of purchasing one from a pet store or a breeder. It was a cold and damp morning on New Year's Eve 2007. My small wildlife rescue was empty for the winter and I was enjoying the relaxing moments before spring would present me with its orphaned critters again. That's when the phone rang and my life was about to be changed forever. On the phone was Judy Hallmark, the Erath County Humane Society's shelter manager. In the previous 8 years, I have fostered quite a number of domesticated animals for the shelter in addition to my own wildlife rescue efforts. Judy had taken me under her wing when I was new in town and encouraged me to become a licensed wildlife rehabilitator. I admire her with all my heart and will be forever grateful for the help she gave me. She is a true hero to me with whom I have the honor to work hand in hand to do what I was born to do: to bring people and animals together so they may understand, assist, and complete each other. On that particular morning of New Year’s Eve, Judy asked me to bottle-raise six newborn Yellow Labrador Retriever puppies. She told me there were eleven in the litter and that five were too weak to be saved and had to be humanely euthanized. They were found frozen half to death under some porch with the mother too far gone to care. She did not have the heart to euthanize the remaining 6 healthy looking pups, Judy said. I could hear her swallowing hard, near tears. "Too many innocent ones had to go this year before they even had a chance," she sighed. I agreed to raise the puppies, but I also wanted to help their mother, so I took her home too. She was such a sweet dog that I named her Honey. 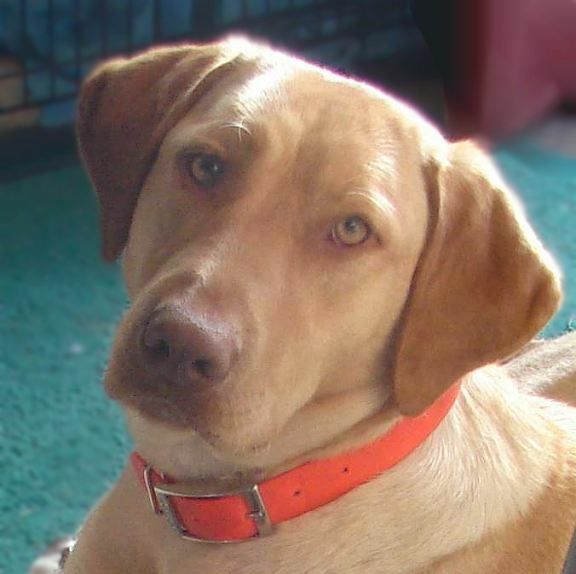 In the following weeks Honey recovered from her obvious past neglect while her puppies grew strong. The entire Lab family was such a delight to take care of, especially one female puppy, the only one with the tan nose. She was the first to walk, to eat solid food, and to be weaned. This puppy will play a bigger role later on. 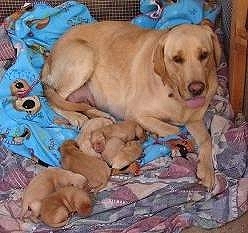 Six weeks later, in mid February 2008, the puppies were almost weaned, the phone rang again. Judy told me about a litter of five newborn Border Collie pups that had been found in a plastic bag on Alexander Road. A caring passerby stopped, picked up the bag, and drove it to the shelter. I picked up the pups and brought them home in a laundry basket. I put the basket down to get fresh towels. Upon my return I found Honey sitting in the laundry basket with the five black and white puppies suckling peacefully. She looked at me with this glare in her eyes that only a mother has.Needless to say, Honey raised those puppies too. Honey displayed such high intelligence that I decided to keep her a while longer after all the puppies were adopted into new homes. I had her spayed and vaccinated and took her to obedience classes. It was clear to me from the beginning that Honey had a higher purpose in life than just being a pet. My plan was to take her to hospitals, nursing homes, schools, and more to make people smile while educating them about animal behavior. Honey was the perfect dog for such a job. She stayed with me for eight months. Somehow the word got out about her skills and my phone rang again. This time it was a lady named Susan Branham. She told me about her son Jacob, who suffers from spina bifida, a serious birth abnormality in which the spinal cord is malformed and lacks its usual protective skeletal and soft tissue coverings. Confined to a wheel chair, her son had been having a difficult time lately and was not very motivated to do anything, she said. A dog might change that, but it has to be the right kind of dog. With every word Susan said, that feeling deep inside us that tells us clearly what's right and wrong, grew louder and stronger, screaming at me that this is it! It was time to say good-bye to Honey. Susan picked her up next day and Honey won everybody's heart in no time, especially Jacob's. There couldn't have been a better ending. A lot people have asked me how I do it, why I am not sad that Honey is gone. How come that I don't miss her? My answer is always the same "Don't cry because it's over; smile because it happened!" The story is not over, however, far from it. Remember the female puppy with the tan nose that stuck out? She was named Trinity and ended up being the "shelter dog", like a mascot to the shelter. She grew up amongst dogs and people, displaying the same sweet character and intelligence as her mother Honey, even though she lacked obedience and leadership. It was planned that I take Trinity in over the winter months to teach her the basics. 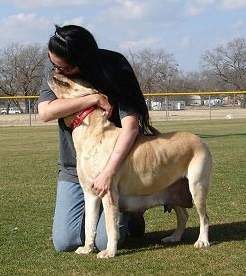 In November 2008 Trinity turned up missing from the shelter. Previous occurrences at the shelter led us to believe that she was stolen. We immediately started with the search efforts: printed out flyers, informed the police and animal control, called the newspaper; even Crime Stoppers offered a $1000 reward for her safe return. We all were worried sick! Exactly a week later she was found at the Dublin animal shelter! How she ended up there will probably never be known, but she was safe and healthy. Or so it seemed. It was obvious that life at the shelter was not in Trinity’s best interest. After she was spayed, I took her in to teach her basic obedience and then put her up for adoption. Trinity looked and behaved so much like Honey, even my husband and my neighbors started calling her Honey. Trinity turned out to be a fast learner and she absolutely loved to do tricks. As with Honey, I pictured Trinity visiting hospitals and schools. I taught her how to stop, drop and roll and dreamed about a future with the fire department. Surely such a smart dog had a bright future and if not, I was more than happy to call her my own. As with her mother, I knew Trinity was meant to be more than just my pet. On a hunch I contacted Susan Branham to see how Honey was doing and if she wasn't by any chance interested in adopting a second dog. 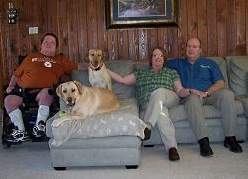 She replied stating that they are in the process of adopting a chocolate Lab from a Lab rescue in the Metroplex. What a shame, I thought, I asked a little too late. I continued working with Trinity and started to look for ways to permanently keep her, when she screamed out in pain one evening and started to walk on three legs. She always had a slight limp to her right hind leg, but she never showed any signs of pain, so we didn't pay much attention to it. Her condition worsened and I decided to take her to the vet for an x-ray. The diagnosis was hope-shattering: she must have sustained a severe hip injury as a puppy which was left untreated. As a result her bones had suffered severe damage. 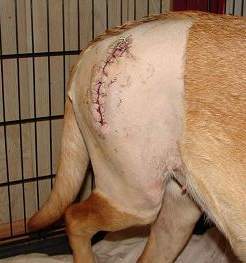 Only extensive surgery or pain medication for the rest of her life would make her life comfortable. She was only one year old. There was no doubt in my mind what had to be done. I immediately started a fundraiser and with the help of my own mother in Germany, Randi Baldwin from the TSU Wildlife Society, and many other generous contributors, we were able to raise the funds for the necessary hip surgery. During that fundraising process I decided to check back with Susan and see if the adoption of the chocolate Lab worked out. It had not. I explained Trinity's situation and Susan agreed to give her a chance. We set up a visit and had Trinity spend a day with Honey before the surgery. If mother and daughter get along, they would consider adopting Trinity after the surgery and recovery. I was thrilled! It all worked out like a Hollywood fairy-tale. The surgery was a success. Animals like Trinity are taken to the shelter every day and without people to adopt them into their own loving families, many will be put down. Instead of going to a pricey breeder or a pet store to buy a puppy or kitten.